Promultis offers motion-activated and multitouch solutions that allow the user to interact with immersive, instructive and entertaining content. Promultis screens can react to a user’s presence triggered by a camera or touch sensor and track their behaviour. There are over 30 responsive touch and gesture effects that can be applied to screens, video walls, kiosks, touch tables, projection surfaces, and any custom configuration. Givaudan is the global leader in the fragrance and flavour industry, offering its products to global, regional and local food, beverage, consumer goods and fragrance companies. Promultis supplied a 3×3 video wall with a liquid dissolve effect activated by a visitor’s presence. 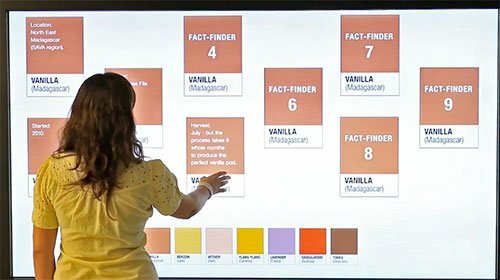 The multitouch screens allowed the user to explore videos and discover facts about Givauden products by swiping through a series of colour and image swatches. The Cumberland is a innovative property in the Guoman Hotels collection. With its modern interior featuring life-size statues, a futuristic water fountain, and elegant lighting design in soft hues. Promultis designed and developed a bespoke custom gesture and touch solution on a video wall installation in the hotel lobby. The screen reacted the a visitor’s movement and changed the image using a polygonal pattern. A touch interface activated upon contact with the wall showing images and facts about London attractions.